In our readings today we are given strong contrasting images: darkness and light, sight and blindness, sin and sanctity. I am reminded some of Advent, which wasn't all that long ago. Yet as the opening prayer proclaims, "Easter hastens." The scripture invites us to reflect on contrasting ways of life, and to consider that God gives us a true season of grace in which the Holy Spirit may transform our lives actually to contrast other possible ways of living or being. The scripture today serves to call us forth into the light and vision of a new life. There are many ways that today's gospel would be the perfect gospel to read for a baptism. It presents us the opportunity to reflect upon and consider the grace we receive in the sacrament—whether it's the upcoming baptism of the catechumens at Easter or perhaps the baptism of a new member of the family. We also may recall and reflect upon the meaning of our own baptism. Essentially, the scripture invites us to reflect upon the ways of salvation, and for some it may be offering the invitation to partake in the goodness and grace of God for the first time. In a true way, we are like the man born blind in the gospel story. He stands for each and every person who comes into this world. Although we arrive in this world innocent of personal sin, we nevertheless arrive with the need to be made new in our humanity—we arrive with a certain inherited blindness. It's common to all of us that from the moment of our birth we are ready to be sent to the pool of baptism. Yet, like the man of today's gospel, we are able to stand near the Lord of newness and receive his good favor. A key phrase to our understanding is "not as man sees does God see." It may be that we are accustomed to thinking of Lent as a season of penance, as a time to do without something, a time to discipline ourselves. Certainly, all of this is true. Lent is indeed a time for repentance, and a time for self-denial and discipline, but it may be that we do ourselves something of a disservice if we fail to see Lent as a season of grace, as a time to receive the Lord's merciful healing and renewal. Lent is a season of salvation. It is a time for putting away old things and putting on newness—if I were a Pentecostal or Evangelical I might call it a time of revival, and there is a certain truth in this way of thinking. The season of Lent speaks to us of the journey of salvation—of being set free from sin. Interestingly our readings today include the image of anointing, which of course is strongly symbolic in the Catholic rite of baptism. In the first reading Samuel poured his horn of oil over David before the witness of his kinsmen and the scripture tells us that "from that day on, the spirit of the LORD rushed upon David." We also share in the anointing, and our hope too is that the Spirit of the Lord will rush upon us; that is, we are to look for the visible signs of the presence of God in our lives. Coming to right relationship with God, as well as coming to right relationship with one another—with spouses, children, siblings, and parents—is brought about by following the way of Jesus. We've all probably heard something like that before, but maybe we didn't reflect on what following truly implies. Indeed it does imply healing in our relationships, and this is one of the things that make our faith attractive. There was something in the gospel today that helped me to understand a little better. The man born blind went to the Pharisees and upon interrogation he told them that Jesus had made clay and anointed his eyes. Coming to the newness of life in baptism demands first that we follow Jesus to being covered with the earth. The healing that we desire in our lives and in our families, in our everyday existence—in facing our jobs, our tasks and responsibilities—comes to us when we learn to follow. We learn, not simply to put up with life, but to rejoice in its newness though the process itself involves letting go. Our Lenten journey—following Jesus—inevitably takes us to Good Friday. To be washed, to be cleaned, and to be saved we must also be anointed with the earth, as Jesus was also anointed. He had the power to anoint with earth because was to be anointed with earth in his death. The holy balm is made ready for us. Whether by saliva or the tears of Gethsemane, in the Pool of Siloam or at the font of baptism, following Jesus to his death necessitates resurrection; thus, it also necessitates our anointing and our cleansing. Like the man born blind, we come to believe—it is faith that saves us ultimately—and we must say, just as the man told Jesus, "I do believe Lord." The gospel today is perhaps one of the most important readings to us as Christians because it speaks to us of our salvation. Indeed we must identify with the man born blind because allegorically he is exactly who we are. An interesting take on it, DDW. I didn't add "Beautiful" but only because what you wrote still had me thinking so hard even then. This piece was balm itself, beautifully explored and presented, for which I am grateful. Thank you Carol. Funny, these homilies or sermons come as balm to me too. BTW-I took the photos inside the church at St. Thomas More after a private baptism last Saturday. I used the same text as the Sunday gospel, just a shorter version of it. It was actually at the baptism that the homily came to me and I just worked on it the rest of the afternoon bit by bit. It's wonderful. I am still puzzling out that last photo, tho'.. Is that the Cross raised up to a window? It's looking up, at an angle from the back of the cross (a resurrection style cross), which is suspended from the ceiling. 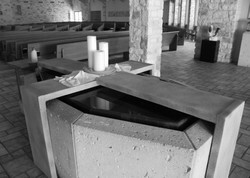 The area above the cross is an a large enclosed skylight that allows natural light to shine down on the altar area.